We reveal some of the most expensive wines ever sold, insured and currently on the market. Perhaps one of the most counterfeited wines is the Romanée-Conti (www. romanee-conti.fr) 1945. Just 600 bottles were produced in this vintage, although thousands of bottles have surfaced, including large-format Magnum and Balthazar bottles that were never filled in that vintage. Wine critic Hugh Johnson once described the process of getting Romanée-Conti wines, which starts by being on a mailing list, which has its own waiting list. An email alert is all the notice you’ll get for an offer the next day. A bidder purchased one in Christie’s fine wine auction for a staggering US$123,900. Its nose includes Asian spices and black truffles and has been regarded as a very vigorous wine that would likely be great to drink for at least 10 more years. Renowned New York wine merchant William Sokolin valued a bottle of the vintage from Château Margaux (www.chateau-margaux.com) at about US$500,000, although his claim was never tested on the market as a waiter unfortunately knocked it over at dinner at the Four Seasons. The vintage from Thomas Jefferson’s collection now holds the record as the most expensive bottle ever broken as it was insured for a hefty price of US$225,000. Reaching astronomical prices of US$500,000, although later discounted as the money was for charity, the 1992 Screaming Eagle Cabernet Sauvignon holds the prized position as the most expensive bottle of wine ever sold. It is said to have a compelling nose of a combination of cassis, jammy berries, blue fruit, plums and chocolate, with a great balance of texture, power and finesse. The Californian wine has been given 99 out of 100 in a tasting by esteemed wine critic Robert Parker. The 6ℓ bottle, which was released only in 1995, won the highest bid in 2000 at the Napa Valley Wine Auction and was auctioned off by the renowned Fritz Hatton. Bottles are currently still available and sold at US$22,500 for the Magnum at BP Wine (www.bpwine.com). Try a recent 2009 vintage, available at Le Clos’ flagship store at Dubai International Airport’s Terminal 3, where just three 12ℓ Balthazars, housed in an ornate oak case, are available for sale. These bottles, priced at about US$184,810 each, are engraved with gold and come with a number of perks, including a first-class trip to France to visit the Château Margaux estate for a private tour of the cellar and vineyard. The ruby red wine has a number of aromas, ranging from red flowers, violets, and cedar, and will age well for decades in the cellar. The 1985 Domaine Henri Jayer Richebourg Grand Cru Burgundy is reputed to be rich, elegant and complex — it has wonderful depth of fruits like cherries and plum, with spices and a touch of chocolate. This vintage has also been rated 95 out of 100 by Wine Spectator. It is available at Y18 Elegant Spirits Ltd (www.y18.hk), and can cost up to US$18,923, with a record high of US$109,107 for a magnum bottle. If you’re in Bali, head to the SIP Sunset Grill, if only to see the most expensive white wine ever sold on display there. Owned by the late wine connoisseur and private collector Christian Vanneque, the wine was purchased for about US$123,000 in 2011. It was awarded 100 points by Wine Spectator and renowned wine critic Robert Parker, and contains high levels of residual sugar in the wine to preserve it from spoiling, one of the few wines with such a property. It now holds the Guinness World Record for the most valuable bottle of white wine ever sold. The bottle is displayed in a bulletproof, temperature and humidity-controlled glass showcase, lying on a bronze hand. In 2010, at a Sotheby’s (www.sotheby.com) wine auction in Mandarin Oriental Hong Kong, three of these bottles were sold for a record HK$1.8m or about US$232,126 each, far above their original listing price of about US$6,449. The rare bottles came directly from Château Lafite’s cellars and were the oldest wines in the auction. It is a pre-phylloxera vintage that has come with ‘very good tasting notes’, according to a report by the Wall Street Journal. It also set a record as the biggest haul in a single sale for such an auction. Spring is the season of a thousand festivals. 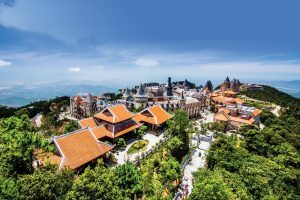 Get ready to be dazzled as we visit six of the most scenic places in Vietnam….